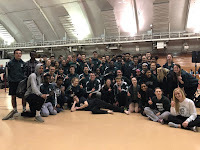 The 2012 track and field season is off and running...the boys and girls team began their season with a varsity competition inside the Kachel Fieldhouse at the University of Wisconsin - Whitewater. The Spartans introduced many new athletes to the sport of track and field and some of our old athletes went out and ran/threw/jumped at or better than then their PRs (personal records) from the end of last season. All the athletes competed at a very high level and impressed the coaching staff across the board. Micah P. made the finals of the triple jump and finished 9th with a jump of 39-00.50, Marissa H finished in a tie for 7th in the high jump with a height of 4' 10", Corrine F and Jessi F both made the finals of Shot Put throwing 31 - 11.00 and 31 - 6.50 for 7th/8th respectively, Daurice F qualified 8th for the 55 Hurdle Finals but improved his time to a 8.09 to finish 3rd in the Hurdles, McKenna G qualified for the 55 Dash Finals and finished 6th with a 7.68 time, and many athletes who had 9th, 10th, and 11th places just missing out on scoring points for the team. This meet was a great starting point for the season. We look forward to adding more people to the competition roster and developing a well-rounded line-up for every meet. Keep up the great work at practice, take care of your grades at school, and expect big things for the rest of the season.